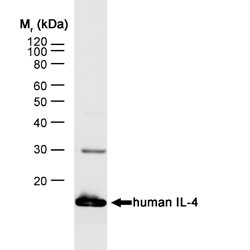 Western blot analysis of human IL-4 recombinant protein probed with Rat anti Human Interleukin-4 (MCA1525) followed by F(ab')2 Rabbit anti Rat IgG:HRP (STAR21B). Rat anti Human Interleukin-4 antibody, clone MP4-25D2 recognizes human Interleukin-4 (IL-4), also known as B-cell stimulatory factor 1, Binetrakin, Pitrakinra or Lymphocyte stimulatory factor 1. Interleukin-4 is a 153 amino acid ~17kDa cytokine involved in the activation of B cells, macrophages and monocytes (UniProt: P05112). Polymorphisms in the IL-4 gene are associated with susceptibility to, and outcome of ischemic stroke (Marousi et al. 2011). Rat anti Human Interleukin-4 antibody, clone MP4-25D2 is reported to neutralize IL-4 activity (Abrams et al. 1992 and Carvalho et al. 1994). Purified CHO cell expressed recombinant human IL-4. 1Membrane permeabilization is required for this application. Bio-Rad recommend the use of Leucoperm™ (Product Code BUF09) for this purpose. Kubota, M. et al. (1997) Oral immunization with simian immunodeficiency virus p55gag and cholera toxin elicits both mucosal IgA and systemic IgG immune responses in nonhuman primates. J Immunol. 158 (11): 5321-9. Patterson, B.K. et al. (2001) Leukemia inhibitory factor inhibits HIV-1 replication and is upregulated in placentae from nontransmitting women. J Clin Invest. 107 (3): 287-94. Carvalho, E.M. et al. (1994) Restoration of IFN-gamma production and lymphocyte proliferation in visceral leishmaniasis. J Immunol. 152 (12): 5949-56.